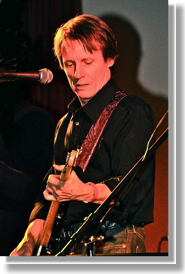 Terry Manning is a music producer, songwriter, photographer, recording engineer and artist known for work in rock, rhythm and blues, and pop music genres. In 1970, Manning licensed release of his own solo album, Home Sweet Home, on Stax's Enterprise label, re-released with extra tracks by Sunbeam in 2006. Later working as an independent, Manning produced or engineered recordings by Joe Cocker, Wattstax, Alex Chilton, Big Star, James Taylor, Leon Russell, Led Zeppelin, ZZ Top, Jason & The Scorchers, Rhino Bucket, George Thorogood and The Destroyers, Joe Walsh, Johnny Winter, The Rainmakers, The Fabulous Thunderbirds, Molly Hatchet, The Angels, Johnny Diesel and The Injectors, Lenny Kravitz, Jimmy Buffett, Shakira, Crash Test Dummies, Shania Twain, Bryan Adams, Widespread Panic, and many others. As a photographer, Manning has photographed Chuck Berry, Terry Reid, Lenny Kravitz, Procol Harum, Steppenwolf, Janis Joplin, Jimi Hendrix, Dusty Springfield, and many other musical artists of the rock period, as both an independent and as a writer/photographer for New Musical Express. He was one of the last to photograph his acquaintance, Dr. Martin Luther King, Jr., on the day before the tragic assassination. Manning’s photography is now being presented in Exhibitions across the US, as well as many world locations. In the mid 1980s Manning moved to London, and worked for a year out of Abbey Road Studios. 1991 saw him founding Lucas Engineering, a boutique audio company which makes professional audio recording gear; this company expanded in 2008, adding microphones to their arsenal of products. Lucas Microphones, under Manning’s guidance, have since become amongst the top high end recording devices in the audio world. In 1992, Chris Blackwell of Island Records fame sought out Manning as a partner to revitalize Blackwell's famous Compass Point Studios in Nassau, Bahamas, which Manning operated successfully for over 20 years. Manning’s newest releases as an artist are the ECR Music Group/Lucky Seven Records release of Manning’s newest (January 2015) album “Heaven Knows,” an emotional look into human emotion, and “West Texas Skyline,” A Tribute To Bobby Fuller, released in October 2013. For a longer, more complete bio, click here.